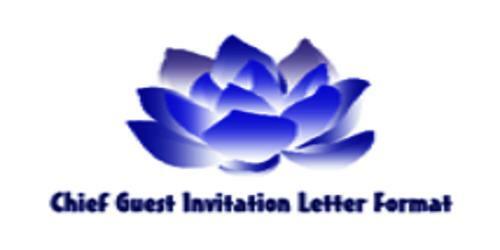 How to Write a Letter to Invite Chief Guest? It happens that several functions are being conducted in an institute or a company or educational institution etc. Some special guest/speaker will be invited as chief and he/she will deliver the welcome address. There are several events for several purposes. Some institutes or company will call chief guest for their conference at National Level or International Level. For example, Graduation day function is also an important event for which the chief guest will be called. If you are the one who arranges a function and needed to call a chief guest through a request letter inviting him/her. In the first paragraph of a letter to chief guest, you must explain your relationship with the chief guest or explain why you are interested to call him as chief guest. like “I am grateful for your meeting with me at Annual conference of business college”. In the second paragraph you must explain the event in which you want to call the chief guest. In the third paragraph, you must directly invite the chief guest and explain the objectives for calling him as chief guest. Also, explain the tasks you asked to do by chief guest like “certificate distribution” etc. In the last sentence, you must be thankful for your chief guest and show your high desire that you want him as chief guest. At the end just pay thanks and Regards. In celebrating the [World Wellness Day], we are privileged to welcome you at the evening party as our chief guest for this special event. The party will be held at the [Area and Place name] on [Date: DD/MM/YY]. The event will kick off at [Time] with drinks served followed by a gala dinner at [Time]. Dress code is smart casual. (Describe on rules and regulations). A few of our guests will give quick speeches and you are mostly welcome and encouraged to give one of your own. If you have any questions or queries, please do not hesitate to contact me at any time. Looking forward to your acceptance and to enjoying a great night with you. How to Verify Trigonometric Identities?